This picture is © Tony Coles and may not be used or published without permission. WE122 visiting RAF Salalah from RAF Watton for 'nav aids calibration duties'. 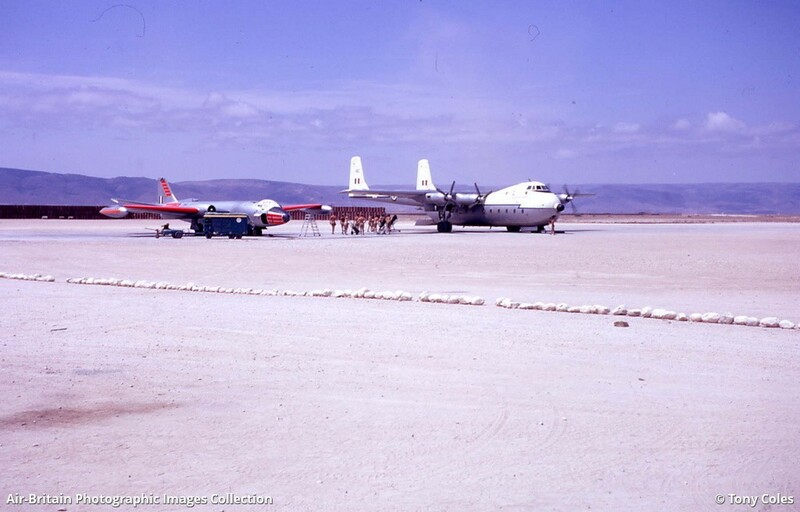 In the background is Argosy XR140 from 114/267 Sqn det. Bahrain. Navigator was Flt Lt Hugh Ayres and pilot was Flt Lt Dawes. Flights for WE122 on the day were Muharaq to Salalah 2.00 hours, Salalah ACR7 local 1.20 hours, Salalah local ACR7 0.30 hours and Salalah to Sharjah 1.40 hours.